iWebU: Web Secret #356: What is it like to be standing here? Web Secret #356: What is it like to be standing here? For the past month, I have been struggling to come up with ideas for blog posts. I used all my tried and true techniques to get inspired. I watched TED Talks, Stumbled around websites, read issues of Fast Company. Nothing worked. Nada. I wondered if it was time to end this blog. But just when I was thinking of throwing in the towel, I came across a fantastic blog, "Wait But Why". More specifically, I came across a mind bending post on that site, "The AI Revolution: The Road to Superintelligence" by Tim Urban. Tim begins the post with a quote "We are on the edge of change comparable to the rise of human life on Earth. — Vernor Vinge." 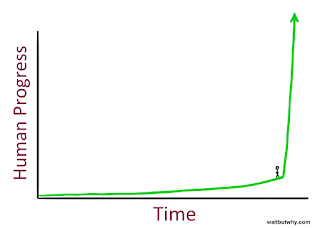 He puts up a graph, showing a stick figure (that's you and me) standing next to a near vertical line symbolizing accelerating human progress. And he asks, "What is it like to be standing here? If we had a time machine, and took a person from the 1500's and brought him to 1750 he wouldn't be that shocked, because 1750 is not that different from 1500. But take a person from 1750 and bring them to 2015, and it would be impossible for us to understand what it would be like for him to see shiny capsules racing by on a highway, look at someone’s face and chat with them even though they’re on the other side of the country, and worlds of other inconceivable sorcery. This is all before you show him the Internet or explain things like the International Space Station, the Large Hadron Collider, nuclear weapons, or general relativity. For him, this experience wouldn’t be surprising or shocking or even mind-blowing — those words aren’t big enough. He might actually die. 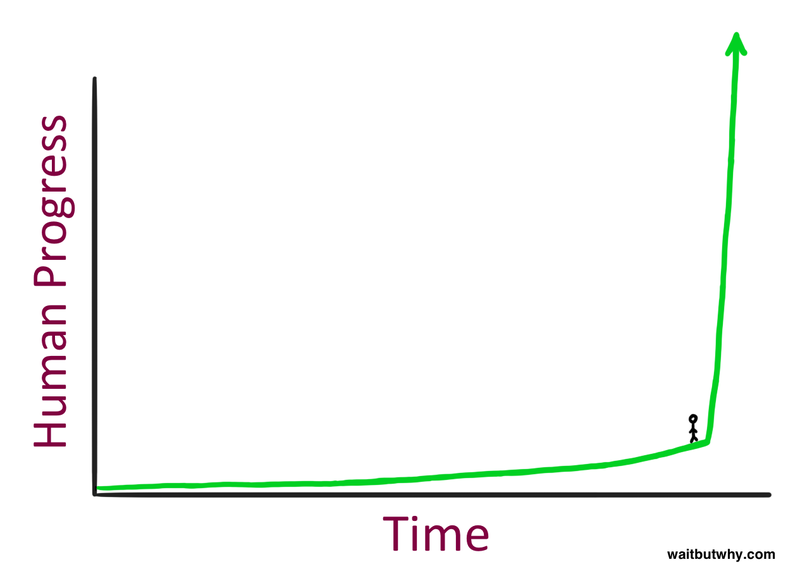 This pattern—human progress moving quicker and quicker as time goes on — is what futurist Ray Kurzweil calls human history’s Law of Accelerating Returns. This happens because more advanced societies have the ability to progress at a faster rate than less advanced societies—because they’re more advanced. 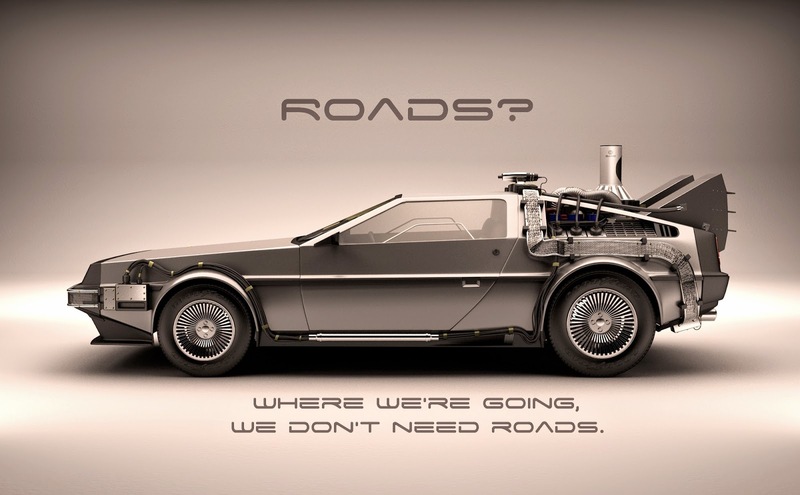 The movie Back to the Future came out in 1985, and “the past” took place in 1955. In the movie, when Michael J. Fox went back to 1955, he was caught off-guard by the newness of TVs, the prices of soda, the lack of love for shrill electric guitar. It was a different world, yes — but if the movie were made today and the past took place in 1985, the change would be much greater. The 1985 person would live in a time before personal computers, the Internet, or cell phones. A teenager born in the late 90s would be much more out of place in 1985 than the movie’s Marty McFly was in 1955. Kurzweil believes that the 21st century will achieve 1,000 times the progress of the 20th century. If he is correct, then we may be as blown away by 2030 as our 1750 guy was by 2015. So what is it like to stand here?